‘Ordo’ versus ‘Ordnung’: Catholic or Lutheran roots of German ordoliberal economic theory? Ordoliberalism is a German tradition of economic and political theory whose influence on the post-2008 European landscape has been substantial. 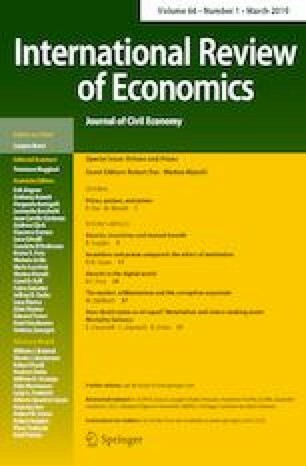 Ordoliberalism professes a strong state to safeguarding competition against monopolies, argues for a strict anti-inflationary policy and for the rigid enforcement of debtor obligations. This reflects the early ordoliberalism’s deep concern with the political and economic crises in Germany during the interwar years. The article demonstrates that early ordoliberalism was simultaneously deeply concerned with religious issues related to social order. Rather than seeing religious and economic engagements as two separate spheres, the article shows their deep interrelatedness in early ordoliberal thought. More specifically, the article seeks to challenge the established view that the religious inspirations of early ordoliberalism were predominantly Catholic, as reflected in the Thomist notion of ordo. By contrast, the article argues that ordo was largely an invention of the post-war strategy of the alliance with Catholic social thought and that the deeper concern of the early ordoliberals was predominantly with Lutheran Evangelical Ordnung. The work presented in this paper was financed by the Gerda Henkel Foundation (AZ 24/V/17), whom the author would like to thank.